I use a lot of terms I made up and I would apologize for that but since all of my old articles (I’m talking back to 2011) are free to read online and I’m easily accessible to talk to on Twitter or in the comments section of this article, I feel like it’s pretty easy to clear up confusion. Some of the things I come up with require a lot of explanation (I’ve written like 150 article about 75% EDH deckbuilding and even I don’t really understand what it’s all about, yet) and some don’t. I would like to think that if I referred again to a U-shaped versus a reverse-J-shaped graph, you can figure out what I mean. Is that the “Just junk it” lady from Mystery Men? 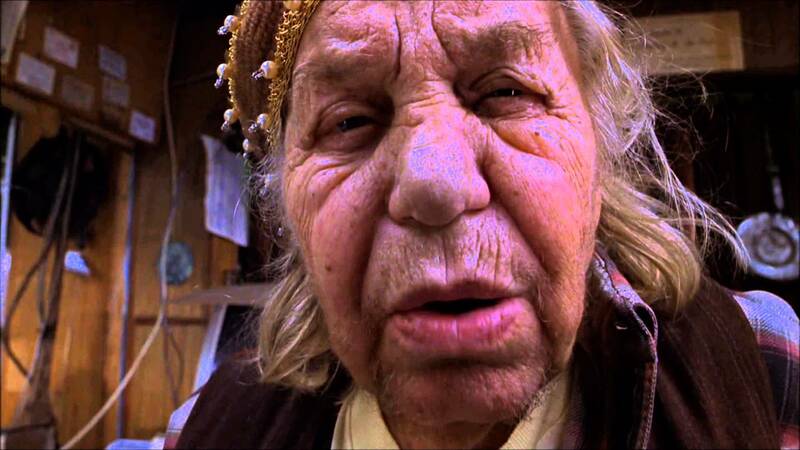 Why are the fake other person’s voices that I use as a rhetorical effect always quoting Mystery Men? That’s so weird, right? Fine, you win, damn. I’ll explain. 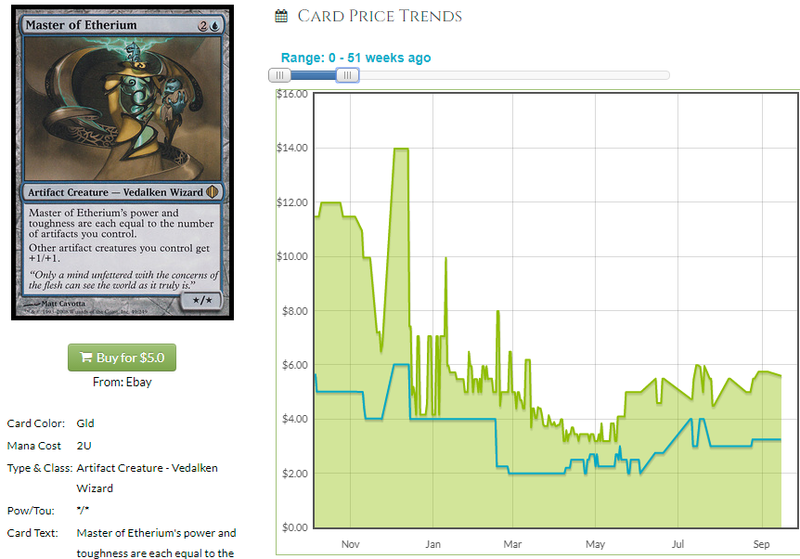 Even though I’m pretty sure roughly 100% of you know what I mean by U-shaped and reverse-J-shaped graphs, I think it’s maybe important to give some examples and at least discuss why I think those two shapes mean a lot to us when we look at EDH prices. You’r going to start seeing U-shaped graphs as missed opportunities which means reverse-J-shaped ones are going to start to look like dollar signs. I mean, not literally. That would be a weird graph shape, impossible on a line plot. Remember that one kid with the long, greasy hair who was still wearing JNCO jeans in like 2001 after everyone else stopped who was always programming weird stuff on his Ti-83 when everyone else was trying to learn integrals? That’s how you get a graph that looks like a dollar sign. Don’t be that guy. 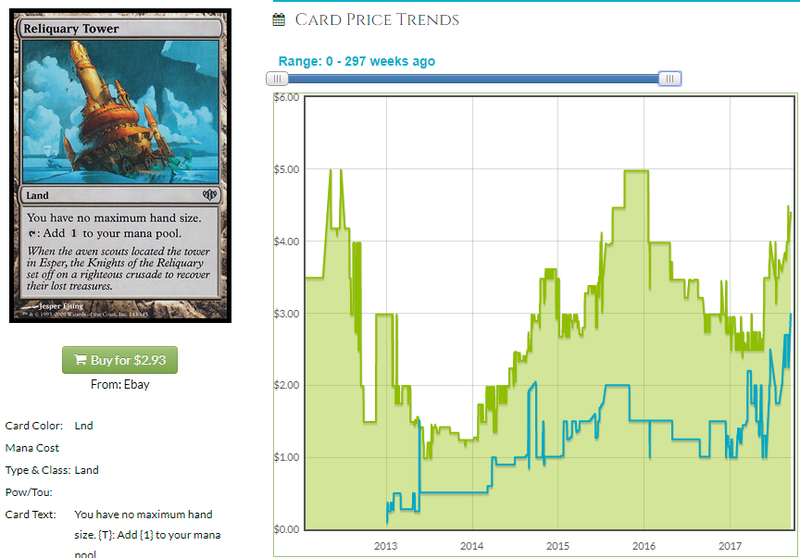 A U-shaped price graph usually means that a price went down for some reason, almost always due to a reprint but sometimes due to a banning, and then went back up again due to demand soaking up the new supply or the card getting unbanned. Here are some classic U-shapes. Something made the price go down and something else, sometimes time, sometimes an event, made the price go back up, If you bought at the top and sold at the bottom, you did a bad job. If you bought at the top and sold at the top, you broke even (ish) and if you bought at the bottom and sold at the top, you makea’ de money. We’re in the makea’ de money bidness around here, so identifying the first half of a future U-shape means we can buy at the bottom. Reprintings and sometimes bannings can create opportunities for us. 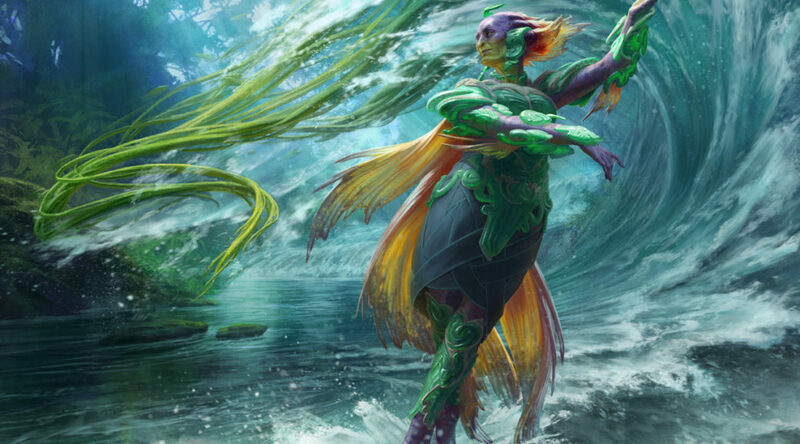 Instead of talking about Ixalan or C17 this week, I decided to look at the stuff from Commander 2016 now that it’s been almost a year since it came out to see what is just about at its low point after its reprinting to see some nice reverse-J-shapes. You may remember this graph from a preview article. 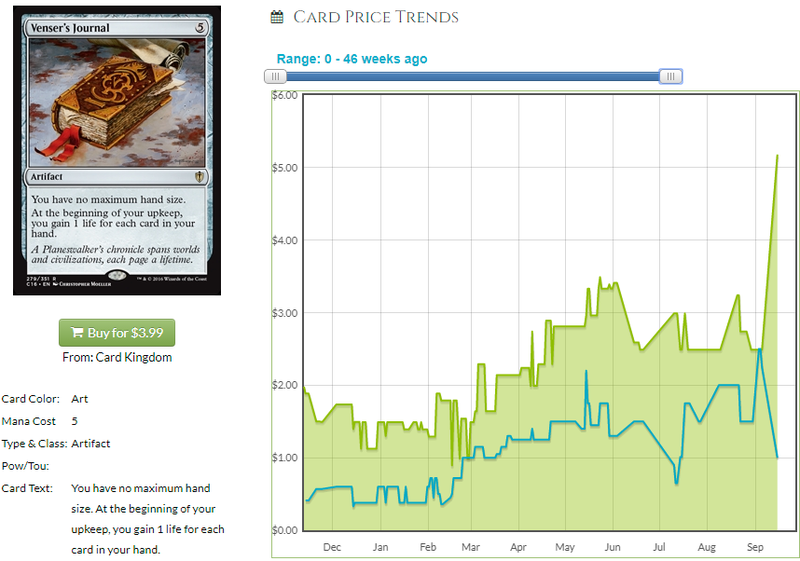 Usually, the card’s price doesn’t recover as swiftly as it goes down, but sometimes it does. One day there are like 40 copies of a card on TCG Player for a dollar more than the low price and then all of a sudden they’re gone and the price corrects quickly. Even slow, consistent demand can trigger an avalanche when someone notices the supply is gone and they need to update their buy price. Cards that are sufficiently good in EDH (and sufficiently unlikely to get reprinted soon) will have upside, so identifying that low point, or one close enough to it that you’ll make just about as much money as if you bought in at the perfect time (which is impossible to know – buying in too early is as bad as buying in too late so I tend to not wait for signs that the price is on its way back up despite that being safer) is something we don’t do enough of in this series because I focus on the future in my articles even though I focus on everything in my own buying behavior. For the purposes of this exercise, we should establish some criteria for a card to discuss. That way if I miss one, you don’t have to ask me if I think the card you caught that I missed is a good pickup because you can just check my thought process and make your own informed decision. Let’s look at some of the cards from Commander 2016 I think have some potential to rebound. We are seeing a nice double dip here on Dragon Mage. 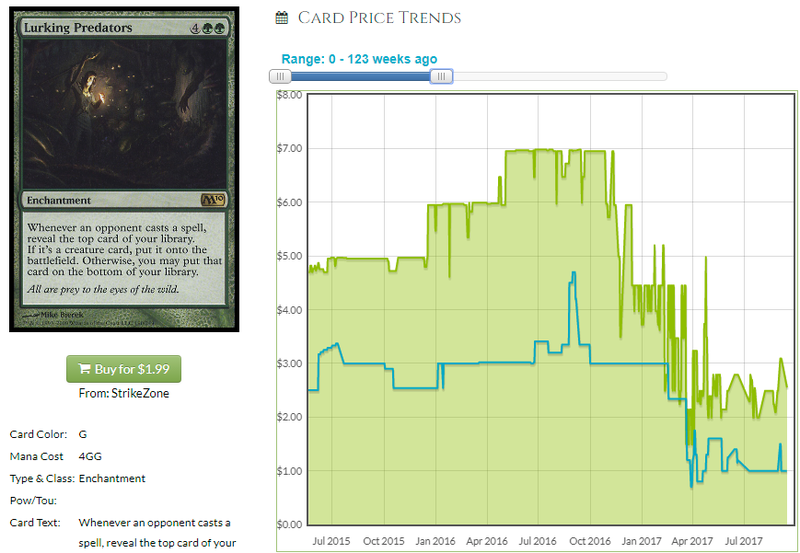 It already cratered after its Commander 2015 printing which was predicated on it being a good card in the Melek deck (…..k?) and Commander 2016 which was predicated on it being a good card for Yidris (that’s legit). Dodging a reprint in Commander 2017, this is a dragon that fills hands up and also fills yards up, because reanimator is a thing. This recovered from its first reprinting and should shake the second off, especially with new Dragon decks not to mention decks like Yidris which are still being built being good venues for this. 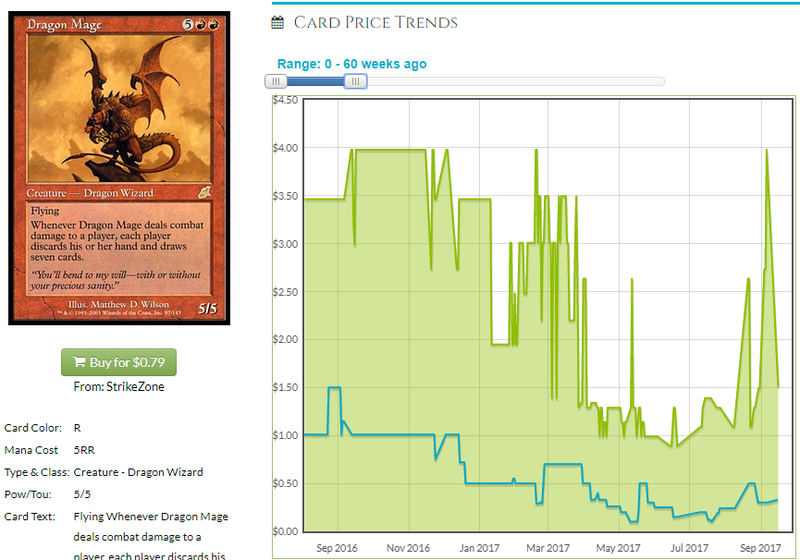 You can get the original version for under a buck but you can get the Commander 2016 version for like $0.60 on Card Kingdom. I think this has upside, is unlikely to get another reprinting soon and I think it’s at its absolute low. It’s considered a bulk rare and that’s where I am getting them. I pay like a dime or quarter when I see these in binders and I make a stack of them. This is low risk, low reward and that’s why I led with it. We can do better, but you can do a lot worse. I feel like I advocated this when it was a better buy-in opportunity but with this declining lately, I think there is a chance to pick these up on the cheap. Decks like Marchesa will never go away and with so many ways to put counters on our creatures to erase the -1/-1 counters, this is a real card. Hapatra and The Scorpion King got people thinking about -1/-1 counters and this jumped a little on that weird logic, but I think as the price of this tails off, you’ll want to buy in. The next time there is a set where creatures get +1/+1 counters, this will go back up if it doesn’t sooner than that on its own. This isn’t all that likely to get another Commander deck reprint imo. This is a longer hold than some of the “sell this when Commander 2018 comes out” picks but this is still solid and if you bought back in May, you had a chance to make money on this card already. This is a card that I identified before the ink was even dry on Commander 2016. I don’t know if this can be $7 again, but it can be $5 and it’s certainly not a $2 card. One interesting caveat about this card is that it’s in the Kynaois and Tiro deck with a ton of valuable cards that all took a hit with reprinting but which should all go back up. This is the worst-selling Commander 2016 deck, but here’s a list of hits. All of which excludes new cards that have upside like Sylvan Reclamation, Benefactor’s Draught, Entrapment Maneuver, Prismatic Geoscope and Selfless Squire. 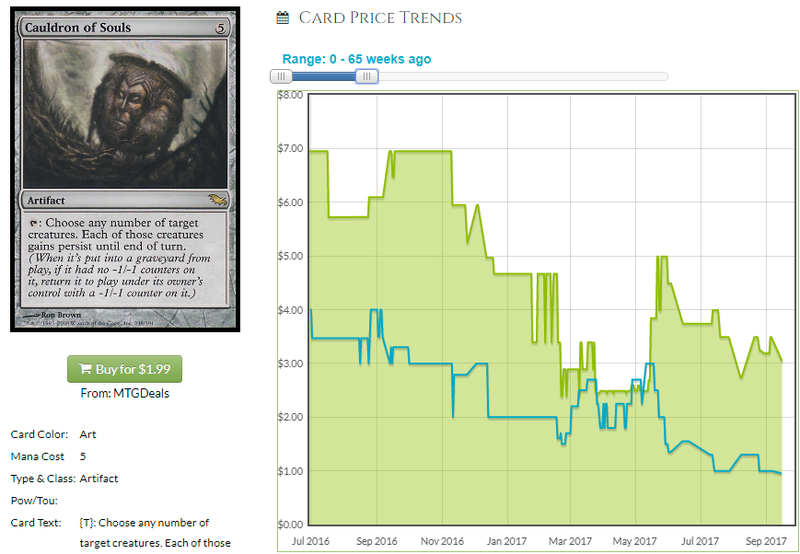 With MSRP holding prices down as long as the set is in-print, I think the prices have more freedom to go up when they’re not constrained by MSRP. We could see this deck silently creep up in price without us really noticing. You can’t have 2 dozen cards over $3-$5 when this is in-print, but two years later you can. I think that bodes as well for Lurking Predators as it does for any of the other cards on the list. We’re breaking our rules a smidge like we did with Dragon Mage since this was already reprinted in Planechase, but this is not just an EDH all-star (it is) but also has upside from formats where people want to attack other people with robots. There is a lot to like about this card. 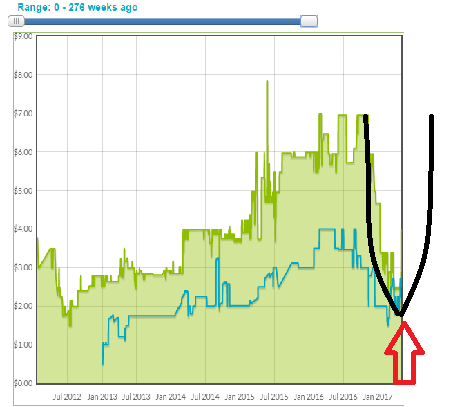 It’s on a bit of a bounce but I still think we got in early enough that we can ride most of the wave to the top. There is more reprint risk for a card with cross-format applicability but there is also little chance of this ever becoming obsolete. I think this is in a good “historic high versus current price” sweet spot. I’d rather pay $5 for something that has demonstrated it can be $15 than pay $1 for something that hit $5 once and might be $3.50 again. The graphical data is a little confusing for this since really low eBay listings are throwing things off. The Commander 2016 version and the Scars version cost almost the same amount. 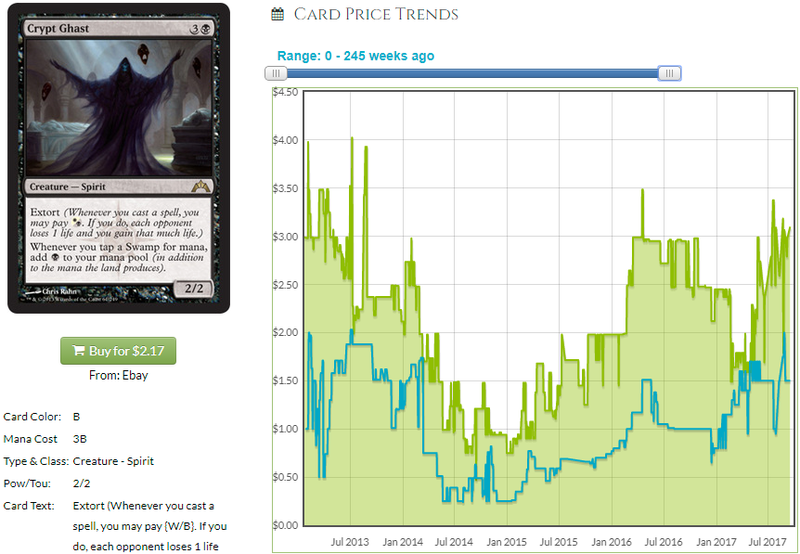 I think we’re about as low as we can go on this card, which means there isn’t much space between its current price and its historical high. So what does that mean? Why didn’t it drop more? It failure to drop near its historic low following a reprinting is curious. While the new version began around $2 or so, the older version maintained a lot of its value. It appears we missed our best time to get in on this card, which is odd because I didn’t really notice anything happening with it until this week. The crept up on us for sure. 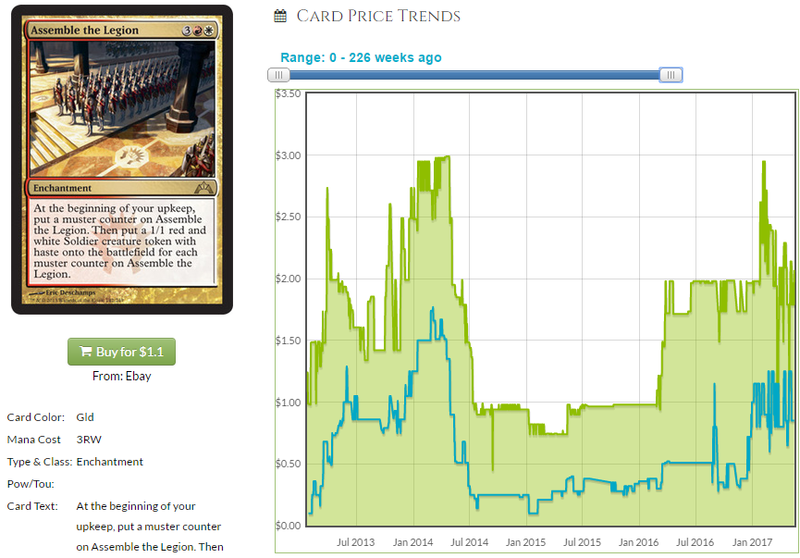 Card Kingdom has both versions for around $4 and that isn’t great for a $7 max card but the price on the older version maintaining so much value leads me to believe that this could rebound and exceed the past historical high. I don’t know what to do here 100%, but I do know that with cards like Tishana coming out, having no max hand size is more important than ever. 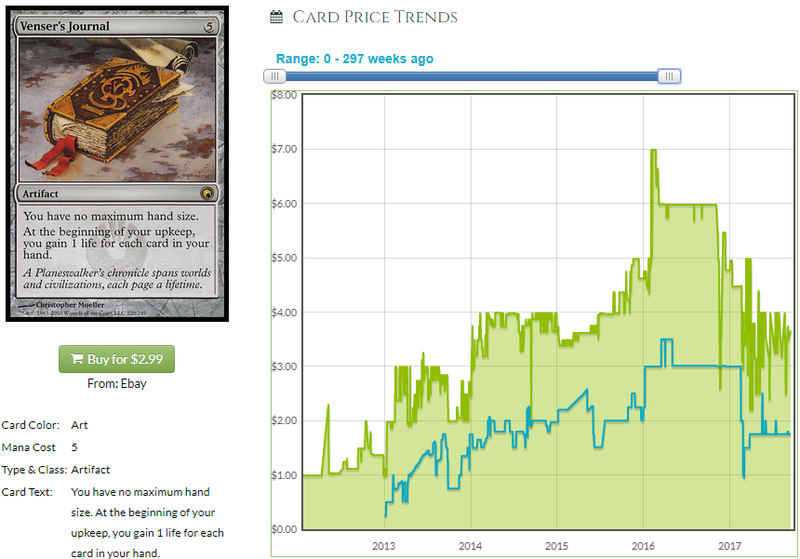 Reliquary Tower, an uncommon, is currently worth more than Journal. I think even getting in at $4 could be profitable based on analysis of the price data which didn’t do exactly what we expect. There’s a lot to unpack here so I will leave you to it. I pays to periodically go back over past sets and see if they did what you thought they would do. When we do Commander 2017 in a year, I’ll be sure to mention what I got wrong and what I got right, one probably louder than the other. Did I skip a card you think has upside? What do you think is at its floor? Is a year the wrong timeframe since we missed the boat slightly on a few cards and we missed it majorly on a card like Wheel of Fate (though that was predicated on a printing outside of Commander 2017 that was impossible to predict)? Let me hear it in the comments! Until next time!